for "any digital code" above 50 MHz. But below 50 MHz, we can't	use "any digital code," and can't use more than 900-Hz shift for Baudot, ASCII or	A MTO R. That interpretation would mean that the new wording says	that it's now illegal to use a Bell 202 modem with 1000-Hz shift	below 50 MHz. A few of us have been on 28-MHz packet radio using	Bell 202's for groundwave and	skywave tests. To add to the confusion, we are now forced to interpret packet radio (as we are practicing it in the U.S.) as "ASCII" below 50 MHz and as "any digital code" above 50 MHz in order to obey the rules as now written. So, I believe that the 900-Hz shift restriction to the three specified codes at the higher speeds may be inadvertent because as I understand the FCC's intent they were hoping to clean up the wording and make the same speed limits apply to all three specified codes. 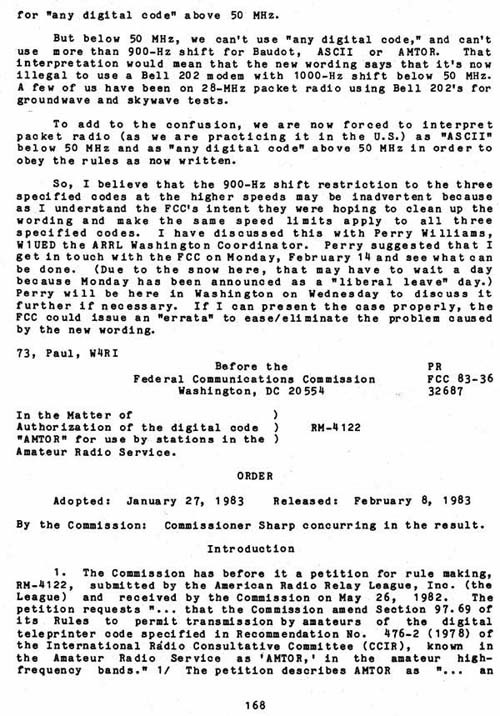 I have discussed this with Perry Williams, W1UED the ARRL Washington Coordinator. Perry suggested that I get in touch with the FCC on Monday, February 14 and see what can be done. (Due to the snow here, that may have to wait a day because Monday has been announced as a "liberal leave" day.) Perry will be here in Washington on Wednesday to discuss it further if necessary. If I can present the case properly, the FCC could issue an "errata" to ease/eliminate the problem caused by the new wording. By the Commission:	Commissioner Sharp concurring in the result.